Everything you love about lasagna, only loaded with nourishing bone broth and in a packable soup form! This is one of the very first soups I made up from scratch all by myself. It has become one of our family staples, and one that I share with so many. 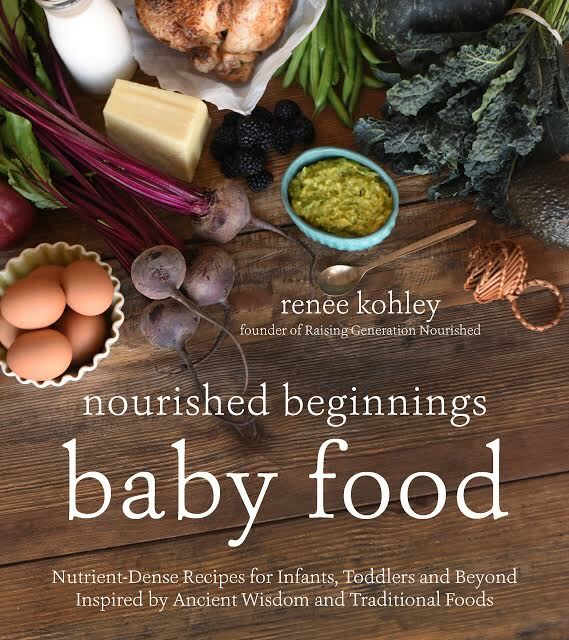 After I had my first baby I quickly realized how nice it would have been to have some meals prepared beforehand…and also just how much nourishment the body needs to recover after having a baby! I struggled with my recovery, and months down the road I vowed that I would never again let any woman that I personally knew go without a meal in her freezer before she had her baby. It was around that time that I started learning to cook from the Nourishing Traditions book, and I really fell in love with bone broth. 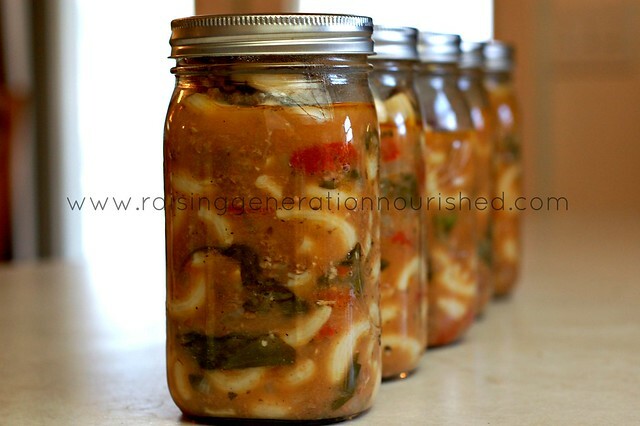 I created this soup for a someone having a baby, and it has become something that good friends of mine know I will be bringing whether it is a baby coming (or baby loss – did you know those mommas need just as much, if not more help? ), an illness or injury having them laid up, or going through a busy season. 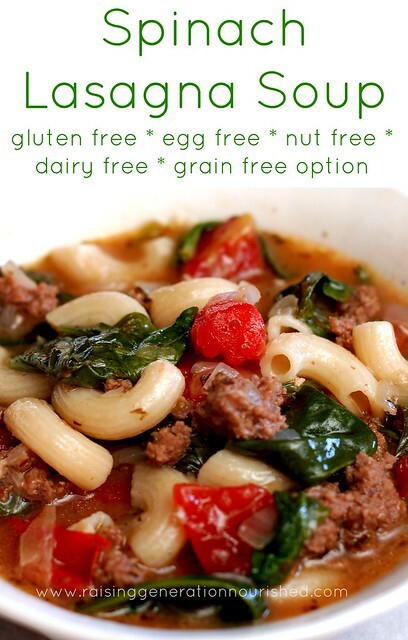 Full of nourishing bone broth, iron replenishing grassfed beef and spinach, and it just plain tastes amazing! 4 quarts beef broth Chicken broth works too. Homemade preferable for the most nourishment – see the Tips section for super simple slow cooker method to make it! ½ cup organic grated parmesan cheese to stir in optional – if you are dairy free it is just as good without this. Brown the beef with the Italian seasoning in a little bit of friendly fat (butter, coconut oil, lard), in a big stock pot, and set aside – don’t drain the fat – that is major flavor! Add some friendly fat and the onions to the pot you just cooked the beef in. Saute them in the beef fat and butter with a pinch of salt to bring out their juices and sweeten. About 5-10 minutes. Add the stock, beef, and tomatoes and bring to a boil. 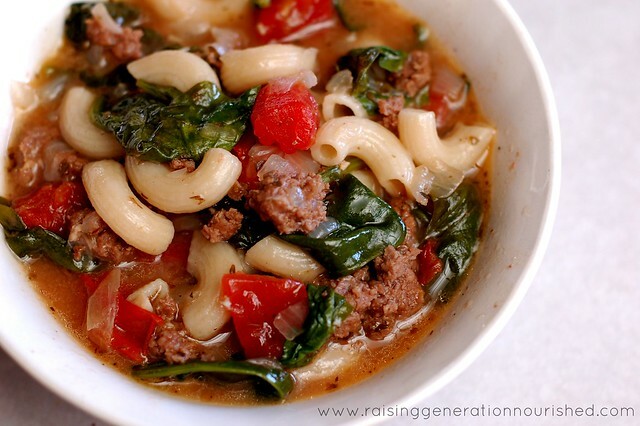 Do not reduce to a simmer – add the noodles and boil in the stock until the pasta is cooked. Turn the heat down to low and add the spinach to wilt and cook through, and melt in the parmesan. Here is how to make your own beef broth (or chicken broth!) – it is so worth the extra nourishment, and especially for a recovering new momma you just can’t beat it! Double up and get it into the freezer for the school and work. This is my husband’s favorite soup, and he takes it along in his travel crockpot to warm up at his desk at work. You can see the thermoses we prefer for keeping soup warm for school lunchboxes here! If you are prepping this for a friend you can either bring it over warmed for them to eat right away, or just freeze it up for them if you aren’t sure if they will need it soon. Most of the time nowadays I like to make and freeze a meal for a new momma to bring to her BEFORE she has her baby – that way she doesn’t need more people coming over while she is trying to get settled in with her new little one. Here are the gluten free noodles I usually go for – they carry them at my local grocer for a great price, and the texture is fantastic – especially compared to many GF noodles. Shop around and see what you can find – just watch the ingredient list. So talk to me! What is your go-to meal to bring to a new momma or someone in need? 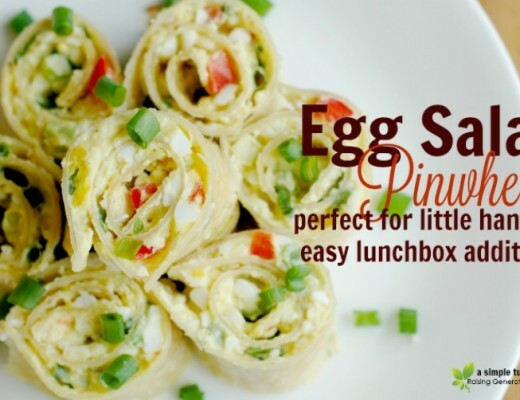 Egg Salad Pinwheels :: Perfect For Little Hands & An Easy Lunchbox Addition! 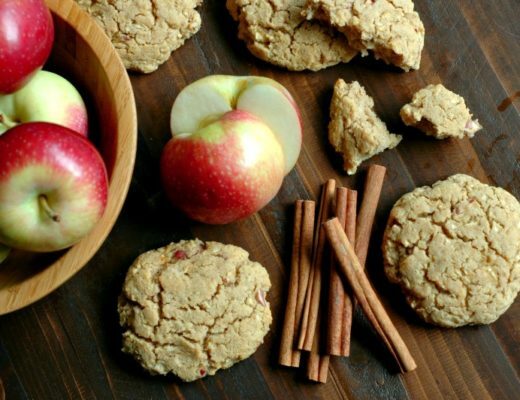 Healthy Apple Cinnamon Breakfast Cookies :: Gluten Free, Refined Sugar Free, & Paleo Friendly! 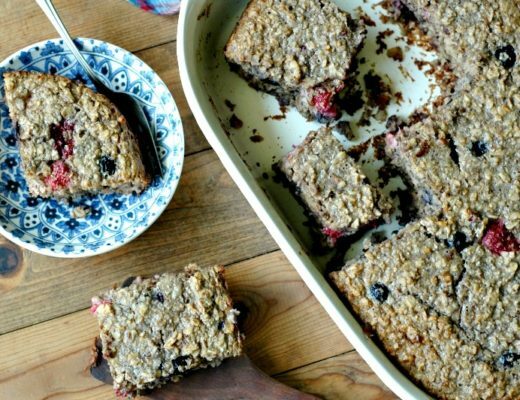 How To Make Soaked Baked Oatmeal :: A framework for a nutritious baked oatmeal that you can flavor any way you choose! This looks amazing!!! Cant wait to make it!! Yum! Looks great for a cold, fall day. I am always looking for new soup recipes and this one looks amazing. I will have to try it. We make this on so often at my house. It’s perfect! Oh sweet! I didn’t know that Jess! Glad it is a crowd pleaser! This is on the menu for next week! Yum. 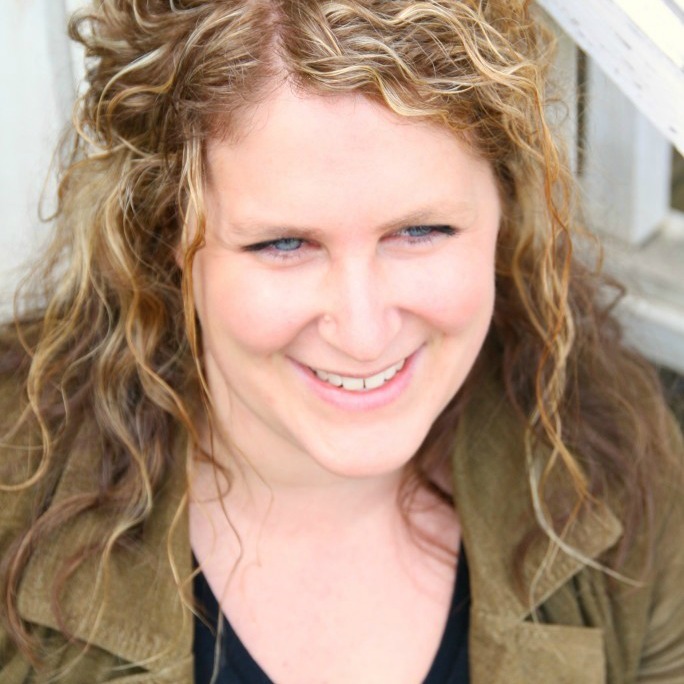 Perfect Megan – I love hearing that! Thank you for taking the time to encourage! Oh super fun! Let me know how the boys like it! You referenced looking in the Tips section for a slow cooker method, but I don’t see it there. I assume the noodles would need to be added at the end (about 20 minutes prior to serving), or is it better to cook them according to the stovetop method and add just before serving? Hi CJ – that comment was in regards to making the bone broth in the slow cooker – not the soup. It was a comment by the bone broth ingredient 🙂 I have not tried making this soup in the slow cooker. Hope that helps! LOL–Bummer! Yes, I have a fresh batch of stock just done in the slow cooker and was looking for a new recipe to try. Thanks! I have made this twice in less than a month. The second time I took half to another family. It makes a great amount!!! Yes it does! So glad you could share the love! This looks so good! Just wondering, how many servings does this make? 4 quarts of beef broth is 16 cups! That’s a lot! Right now, there’s only 2 of us, so we don’t need a ton. Also, I am expecting my first little one in early February and trying to pre-make some meals. I plan to to store all meals in the freezer then cook in the crockpot or easily over the stove. How could I adapt this recipe to do that? 1. Follow steps 1-3, then put everything except the stock into a container and freeze. Then, thaw everything and the stock in a big pot to cook and pick up with steps 4-7. Or 2. Just cook it all, then freeze completely premade in jars to be reheated whenever we want to eat it. Then, since there’s really only 2 of us eating this, we could just thaw out a jar and eat a little at a time. What would you suggest? Or something totally different? Or a way to cook this in the crockpot? Hi Emily! Yes, this recipe is a big one – I typically make it for my family and the other half to give away. You could half the recipe and still have some leftover with just 2 people eating it. My family of 5 will eat half in one sitting some of the time – or just a little leftover. For freezer storeage and best taste/texture of the noodles, I would cook the soup up until the point of putting the noodles in and just stop there – put the soup in the freezer, and then you can bring it to a boil and cook the noodles in when you are ready to eat. I have not tried the crockpot before – noodles are tough in the crockpot in my experience – the texture is off to me!